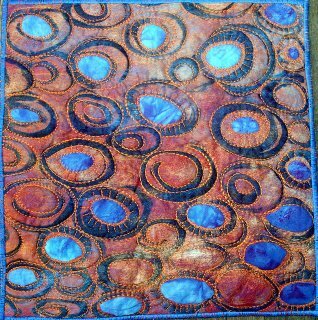 I I I have finally done some work with fabric such as it is- I have been rather aghast at the unfolding events in Gaza. I started looking at the number of Palestinian child deaths since 2000 but decided that in order to see the more complete picture i ought to also see how many Israeli child deaths there had been since 2000 as a result of non-peaceful activities as well . There is actually a website called Remembering the Children which records these statistics which I found on an American website which discusses both sides of the issues. I, and I imagine any other parent in the world would deplore the death of any child in non-peaceful circumstances , but i find the disparity in the figures alarming. For example since 2000, 121 Israeli children have died and 734 Palestinian children- so 6 times as many palestinian children have died as compared with Israeli children- and then when you look at the method of death - many Palestinian children die as a result of gunshots to the head or chest. In 2006 one Israeli child has died ( as a result of contact with an unexploded mortar shell) and 29 palestinian children have died- 31 if you count the two unborn children who died with their mothers. So my fabric I made today is about the loss of children's deaths in palestine. 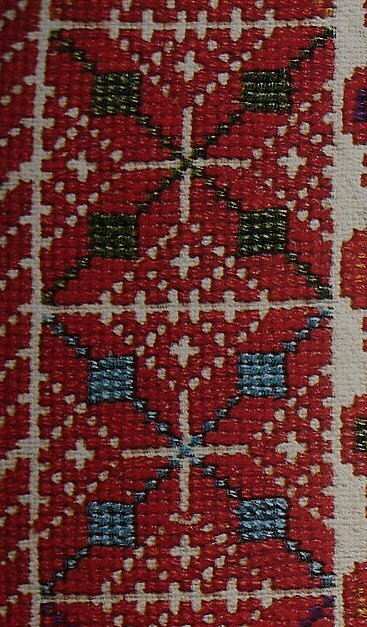 I took a traditional cross stitch motif which i found in a book I was given when I was in Ramallah called "Palestinian Embroidery-Traditional Fallahi Cross Stitch" byWidad Kamel Kawar and Tania Tamari Nasir. 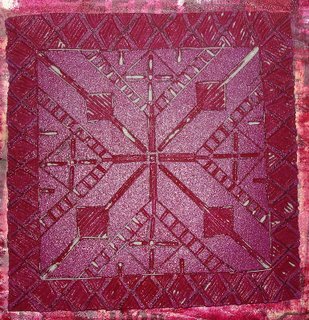 I liked this motif as there were crosses within the crosses ( many palestinians are Christian so the straight crosses are a reminder of that, even armed as early christian crosses were) and then made a lino cut from a drawing I made of the motif. 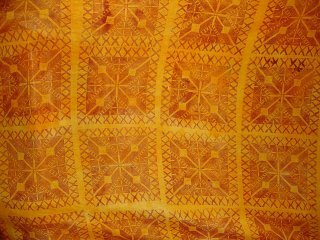 I then printed it onto muslin which is very lightweight and soft. I am sort of thinking that these might be more in the way of comforter as quilts origianlly were but at the moment and am not quite sure where I will go with it- maybe quilt with cross stitch. I did dye some crochet cotton in order to do this. I am still thinking at the moment as to how i will utitlise this. It felt good to finally do something. 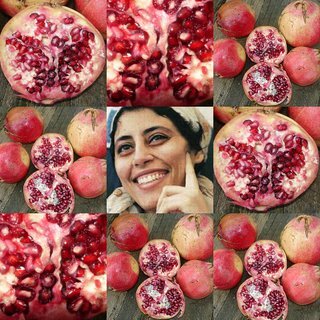 Um Kahlil has pointed out to me that the picture of Fatmeh that I have collaged with the pomegranates is not actually the Fatmeh that was killed last week. The Fatmeh of the picture's story is at another location. The story of the Fatmeh of the picture is just a reminder that so much we take for granted is simply not possible in Palestine even with the best of intentions from doctors in Israel. This morning I woke up to another day dawn grey- but something has been brewing, slowly, inexorably since I went to Palestine. I know I have talked about this before, and by how troubled I was at the injustice I witnessed- and I am even more troubled by the unequal reporting of events as they unfold. In the last couple of days I have been watching with a lot of angst the situation in Gaza- especially since the beach massacre last week and since the kidnap of an Israeli soldier on Sunday. Last Saturday i gave a talk at the Deniquilters Symposium- and I donned the Syrian dress I had purchased in Damascus- the cross stitch so beautiful. Somehow my laptop would not talk to the digital projector ( fortunately I had taken lots of work with me) so i told of some of the things I had seen- but something happened whilst I was standing there in that dress telling them about the women in Ramallah and their response to Across Australia- somehow my breath got restricted and I started to cry- in front of all those people- suddenly it was as if I were faced with that wall, that impossible situation, that injustice. I thought at the time when I was in Palestine that here was another thing that had caused a shift in the way i tread through the world- it arrived in full regalia on Saturday night.The next morning two women brought me beautiful glorious pomegranates. Then this morning I read two blogs I have looked at a lot lately-Sabbah's blog and Um Khalil's blog. 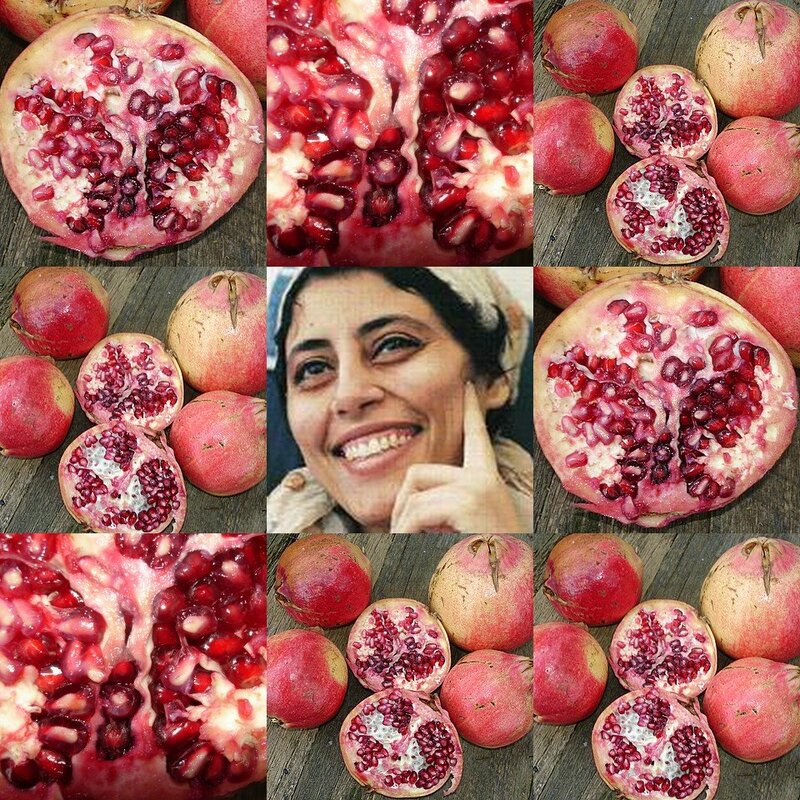 On Um Khalil's blog i found the picture of Fatimah which I have collaged with pomegranates. When I was in Israel, Israeli quilters told me that pomegranates for them was also a symbol for hand grenades in response to my Persephone's Rug for the Underworld quilt- well Fatimah's life came to an end whilst she was sitting down to lunch with her husband , his son and her mother. Fatimah was 37 and pregnant-her picture broke my heart this morning. She was killed by an israeli rocket fired into Gaza to allegedly destroy a terrorist, but which somehow hit the house in which she was eating lunch. Read Um Khalil's blog to see more of Fatimah's story. So my point is- I don't think I can create in the same way anymore- my life has changed. When i was in Israel a quilter took me to a quilt show hung outside of tel Aviv- amongst the quilts that hung there - with the theme trees ; there was a quilt by a woman whose quilt was a political statement about silence being as big a crime as doing- her work was about what is happening to Palestine. So i cannot stand by in silence any more- I can't just talk about quilts or how I make them. My make- up is such that emotion is a strong part of the way i create. I think I have found something I can do with all those cross stitches. 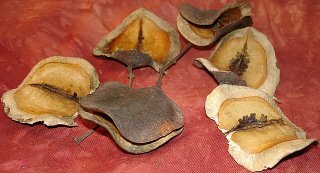 These seedpods are of the jackaranda tree ( I hope I have got it right)- they were too beautiful to leave behind! Jacakaranda trees line the street in which the Multi Arts Centre in Deniliquin is located and where I taught on the weekend.I had a most enjoyable time- as Deniliquin is close to where I did a lot of my growing up ( Jerilderie). Country hospitality was at its best- the food was wonderful and the students who had come from all over enthusiastic. This classroom is much like the one I found myself in when we first moved the Jerilderie from the Netherlands. 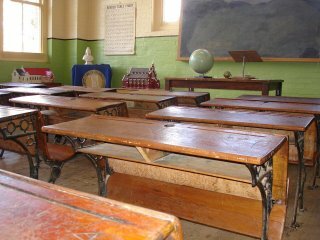 It is now a "museum" room in The Peppin Centre in Deniliquin which is the old primary school. 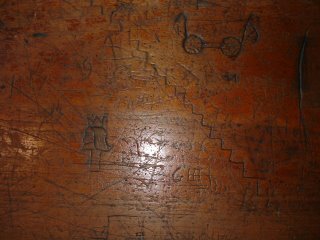 The only difference was that the lids on my desk which I shared lifted up and we really did use real ink and nib pens.And of course could not resist a photo of the inscribed graffiti on the desks.... I am intrigued why the glasses and the head with crown should be so distinctive in this little tableau. 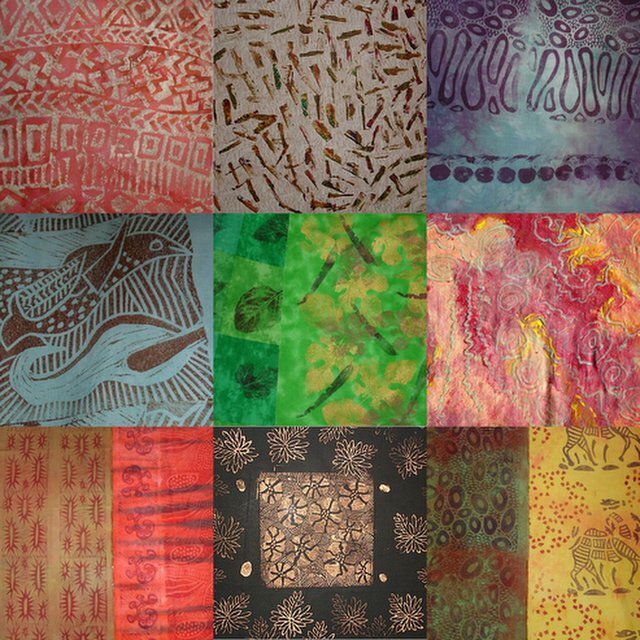 And last but not least some of the work produced by students- I took a lot of lino-cuts and Indian woodstamps for people to use and we tried some African painting as well later in the day.It made me itch to do some printing again- maybe later today if the weather fines up- although it is looking so grey and murky I don't like my chances.Someone sent me a page from Nouvelle Patchwork- the France Patchwork Association magazine and there is a double page devoted to the exhibition I had with Annette and Robert Claxton earlier this year- one page of my work and one page of theirs- it looks very nice! I shall be back in France in September for Val d'Argent. 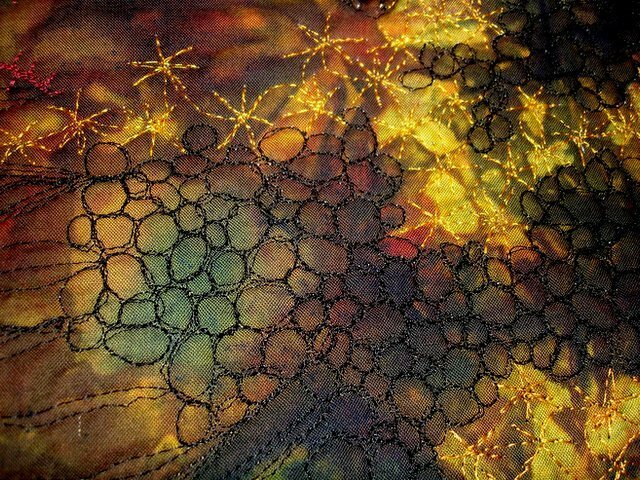 I will be sitting at the Changing exhibition curated by Thelma Smith, and one of my lace pieces will be on display. After that i shall probably be going to Palestine to teach in Ramallah depending on the situation. Finally my fabric has arrived for dyeing- but it is too late to start now as it is after four and it gets dark at five thirty on this the winters solstice. I shall have to do it tomorrow. I have done very little this last week- kids are on school holidays so we went up to my mothers via Melbourne. Dropped into Zartworks and bought some painting things but at the moment am feeling a dirth of inspiration. Everything I look at seems bleah, and my mood matches it- I feel as if I will never think of another idea. So I completed this little lutradur piece I had painted before I went away- just to go through the motions and to try and get back into the thinking and sewing habit. I have been playing around with the idea of crosses- how to incorporate them into some pieces I have in mind to record my reaction to my visit to palestine. 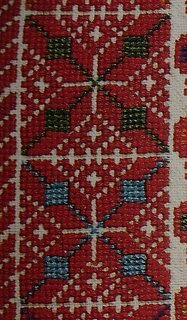 Of course the crosses or cross stitches derive from the palestinian embroidered dresses ( which is also practised in other parts of the region- and the dress I have is Syrian) and I am intrigued by the eveness of the stitching. 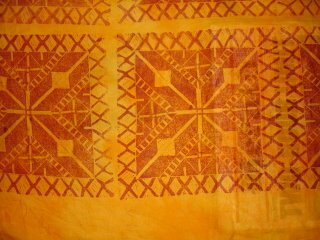 I painted this piece of fabric using the African method but am not that happy with it- I liked what happend but am not enthused by the colour- I think it would have been better with another colour underneath overlaid with darker colours. Stitching will off course pop out elements, but it still needs more playing with and thinking about. Last week Omega on her blog explored why she worked in textile and made some interesting observations, and for me it has to be stitching. I left a comment to her post and Omega responded with this:"Everything has been worked upon, specially decorated and elaborated over and above the basic cloth itself. Traditional embroidery is the overlaying of cultural significance onto bare everyday necessity. These embroideries tell us so much about the peoples whose traditions and beliefs they illustrate." from an article she had written regarding Sheila Paine's embroidery collection. And i do so agree , but there is another aspect and that is the cross as the mark of the illiterate person- why is it a cross? Why not a triangle or two parallel strokes? I suppose the cross is likely to be slightly different in each hand but on the other hand it is the ultimate sign of free will by recording agreement when the cross mark is placed. And yesterday my ETN magazine arrived - it was somehow disappointly sparse ( though I will have another look). 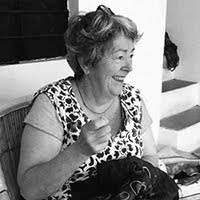 The 3rd European Quilt Triennial was reviewed by Beatrijs Sterk and she comments that there has been symptons of fatigue in analysing Quilt National in the US and signs of stagnation and decline in participation in European quilt events. I think she misses one issue however- there seems to be a regularity to the works selected ( even when another medium juror is used) a certain uniformity- so that the same names recurr and recurr with a few new names . In all my travels I am seeing lots of different work- some very good and it is not being selected.I am not sure that we are seeing the 'edgy' work for which she yearns or work that is designed in a different manner. Sterk seems to think that the medium would benefit from an injection of teaching from other art mediums, but after my experience with my masters I am not sure, what would come from there?- everything has been pushed to the conceptual to such an extent that there is no room for the contemplation of the idea textile let alone its manifestation.I think to work in textile is to accept that it is textile ( and I use the word advisedly- if I wanted a wider ranging word I would have used fibre) and as such there qualities which can be explored/touch , hapticity, shrouding, folding, stitching. 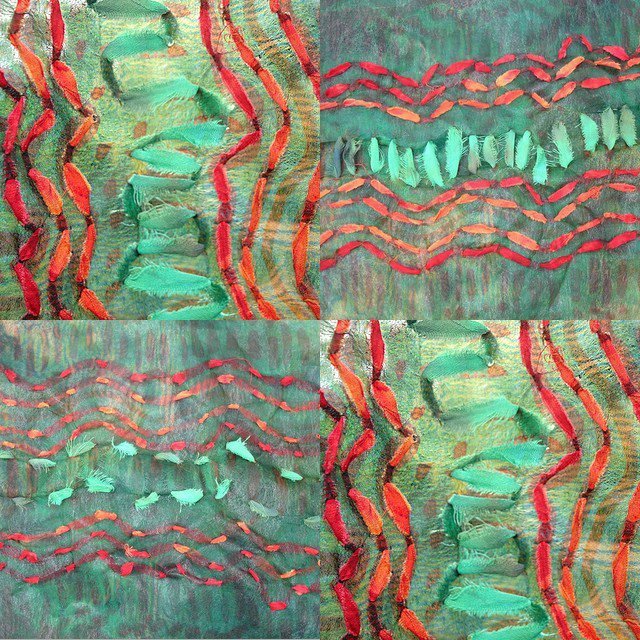 I think one problem with making contemporary quilts is that we are looking for the wall as the medium of its display whereas there are many other ways of interacting with a quilt and a major one is touch- how many people have I not seen try and rub that quilt between forefinger and thumb? I have often felt like curating an exhibiton entitled "off the wall and onto the bed"- if you had to spend a year in a bed what would such a piece consist of for you? It is done- you were right Kristin- it was one of the forest pieces. I however want to oultine the trees a bit more heavily, and the binding has still to go on.As you can no doubt see it is very heavily stitched. One of the down sides of being a textile itinerant is that no one cleans your oven whilst you are away- I try and keep on top of it by cleaning before i go but I don't know what they have done to it this time- I have scrubbed and scrubbed but I don't think I will ever get totally rid of whatever they did to it. And today sitting and sewing I was ruminating about the good old Aussie swaggy ( hobo)- they are gone from the local scene, but when we first arrived in Australia they were still around. I remember one old chap in Numurkah who could play a mean tune on a gum leaf and really did have a swag on a stick- now that would be a fun exhibition to mount- the essential swag! This is to prove I have finally done some stitching. 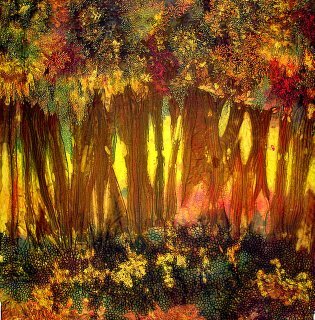 It is an autumn forest quilt I started in the Netherlands. I just have the bottom section to do but am undecided about a small section- so I might sleep on it.School holidays are coming up next week so i want to finish it and be well on the way on working on somethign else. I am waiting for fabric to be delivered so i can dye the fabric. I will also be teaching in Deniliquin in the Riverina in NSW on the weekend of 24/25 june. There are still a few places available if anyone is interested . The contact is ">Marj Gale. I hope the link works- if not email me and I will put you in touch with her. 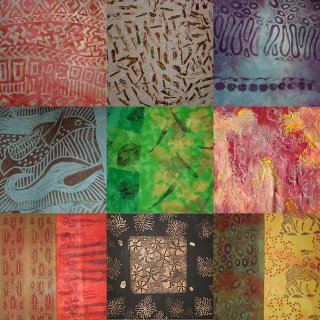 I am teaching journal quilts ( working small and working with a theme and experimentally) and printing and painting fabric with textile ink. The light was great for photographing today- though it was quite cold. I enjoyed the picture of the bird sitting on the wildlife refuge sign. 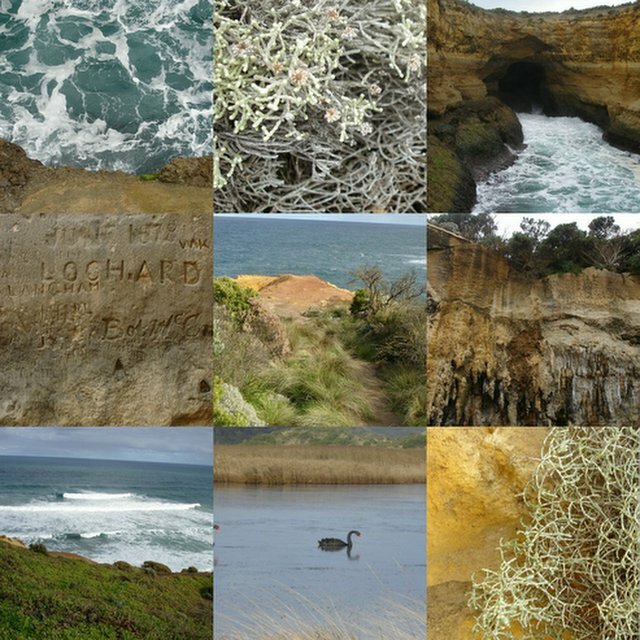 In the second collage there is a black swan- actually it was a pair of swans with three cygnets- but they were just a bit too far out of photo range. I included it because we do not have white swans like in Europe- our swans are black and just as graceful and perhaps a bit smaller. Oh and of course nothing is complete without some graffiti. 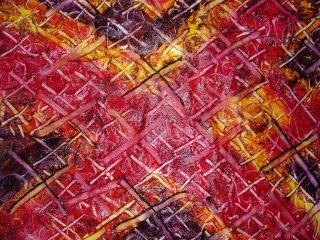 I have been catching up on administrative things- so nothing much textile has been done since my last posting. I have been revamping some of my notes on printing. There are so many books on printing and many websites that give information, that sharing these notes is no great shakes- however please do note that these notes are my copyright instructions. 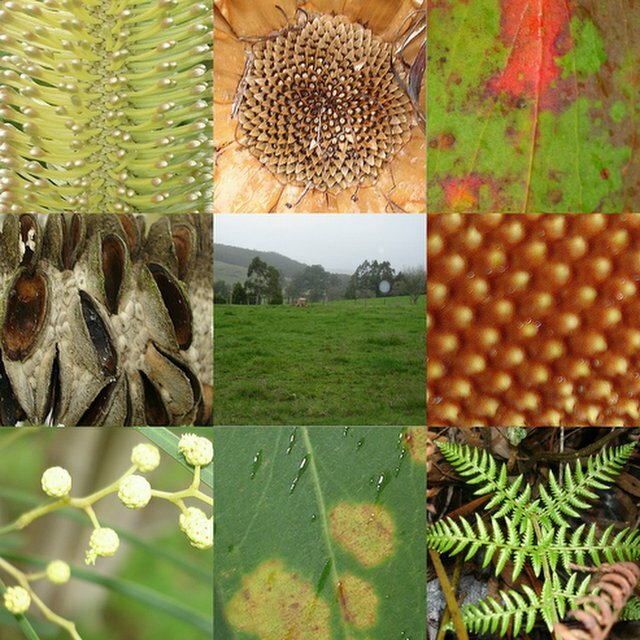 I had wanted to include images, but it is so cold today that I can't go outside . Writing the notes however made me want to start printing again! I also recommend to you Laura Liebenberg's website which has a downloadable pdf document with various techniques with photos.I brought home some more of her textile paints this time as i really like the product and the colour selection is great. I have also appended a list of suppliers I have used in the past. Stencils are also easily made using the stencils plastic used for quilting stencils or architectural drafting paper, or screen printing plastic film. The stencils can be cut with a craft scalpel. Indian wood blocks are also great to print with and can be purchased from Third World shops. Printing inks are made from pigments and chemical binders. Therefore you should be careful in handling printing inks and making sure they are stored safely. Use disposable gloves for you hands and if you are printing large amounts of fabric wear a face mask. The odour of some printing inks can be quite irritating for some people so always work in a well ventilated area. I often print outside on a sunny day. You will also need a foam rubber roller- these are readily available from hardware stores. It is important that it is foam. Otherwise if using stamps or lino cuts a printing pad can be made- by placing some foam rubber onto a hard waterproof base. However I tend to use a roller that is about 3-4 inches wide. I wet the roller first and then squeeze it as dry as I can with my hands. I then put a good tablespoon of printing ink onto the plate (or foam meat tray that you get from the supermarket). I roll my foam roller through the ink ensuring that I get even ink coverage over the whole roller. I lay the object with which I intend to print on a sheet of newspaper next to my printing mat and roll the ink as evenly as I can over the surface of the object. You need to ensure that the ink coverage of the object is not too thick or too little (you will get the feel for the right amount after printing a number of times) I usually print my first print onto paper to make sure it prints properly. You are now ready to print onto fabric. Roll some more ink onto the linocut or object and press it ink side down onto the paper. Press it evenly all over and trying to make sure you don’t move the object (this will blur the print). I use a brayer (a smooth rubber roller used in paper printing) to roll over the back of the object especially with lino cuts. If you are printing with foliage I place a piece of paper over the back of the foliage once it has been placed onto the fabric and press the newspaper covered foliage evenly. If the printed image is too blobby- you have too much printing ink on the surface of the object you are printing with. You may also have too much textile ink on your foam roller. 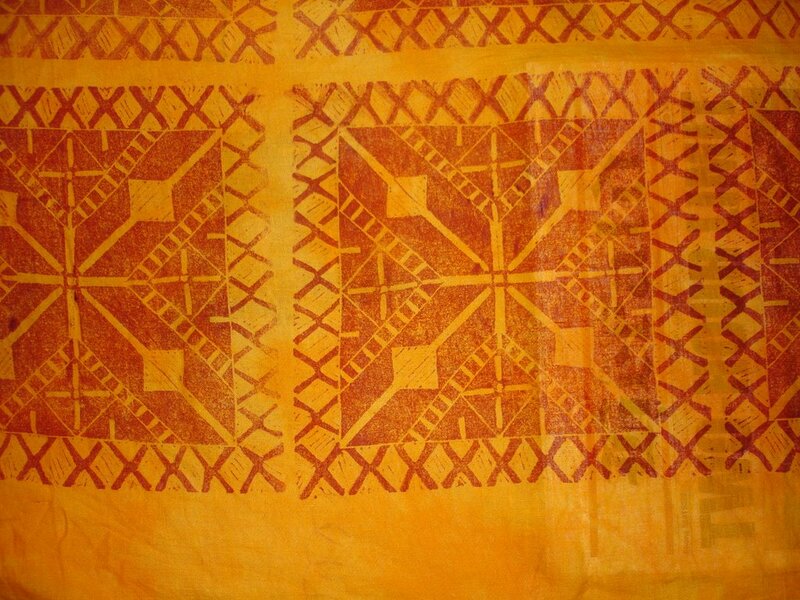 If the image is too light or patchy you have not put enough printing ink onto the object you are printing with or you have not put enough textile ink onto your roller. If the image is streaky you have rolled the ink in a streaky manner- the streaks actually print. 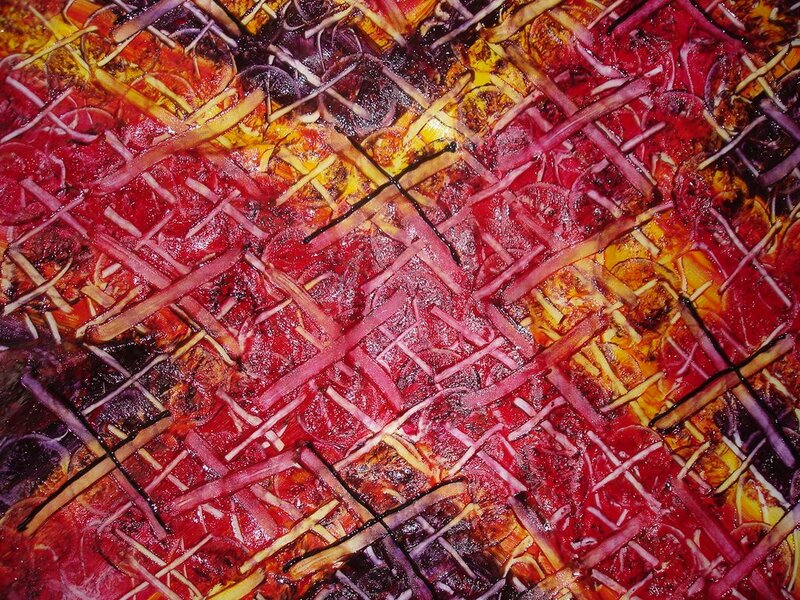 This is why I do not use a brush to apply the textile ink as the brushstrokes also print. If the image is blurry you may have printed too many prints with the object- the ink tends to build up on the object and can coagulate, especially if the weather is warm. So it is best to wash it and start afresh. It is also possible that you moved the object ever so slightly in the pressing down process. Basically any image can be used to create an image on lino- however those with clear lines and delineated areas work best. I often use photos and place them on my scanner and blow up the image to the size I would like. I then reduce the image into gray scale so that I can clearly see areas of shadow and see the lines more clearly ( grey scale actually works better for this than reducing into black and white- you ca also use this process to create stencils). I then tape a piece of carbon paper face down onto the lino and place my grayscale image over the top and trace over the lines I want to show (I know carbon paper is from the antique days so you can also do this with a ballpoint pen and press hard so that the lines dent through onto the lino) Once the image is transferred you can then cut the lines. I am always looking to create texture with my linocuts. Lino cutting is actually working in reverse so that you have to think carefully about positive/negative imagery. What you cut away does not print- what you leave behind does. If the lino you are cutting is too hard- you can warm it by placing it in a low temperature oven for a few minutes. You may need to do this several times in the cutting process. Do not place the lino in a microwave! Always cut away from you. The cutting tools are very sharp and can create nasty gashes in your hands. When the lino has been cut it can be mounted on a piece of wood like a stamp, however I dind with bigger lino cuts that the lino is easier to use unmounted as then I can roll the brayer all over the back of it for more even pressure. The beauty of lino cuts is that they can be used again and again. You will need to wash your lino-cut when you have finished printing- this is easiest done with a brush and hot water and preferably in your laundry sink, as printing ink is a chemical and probably best not used to wash down your kitchen sink. 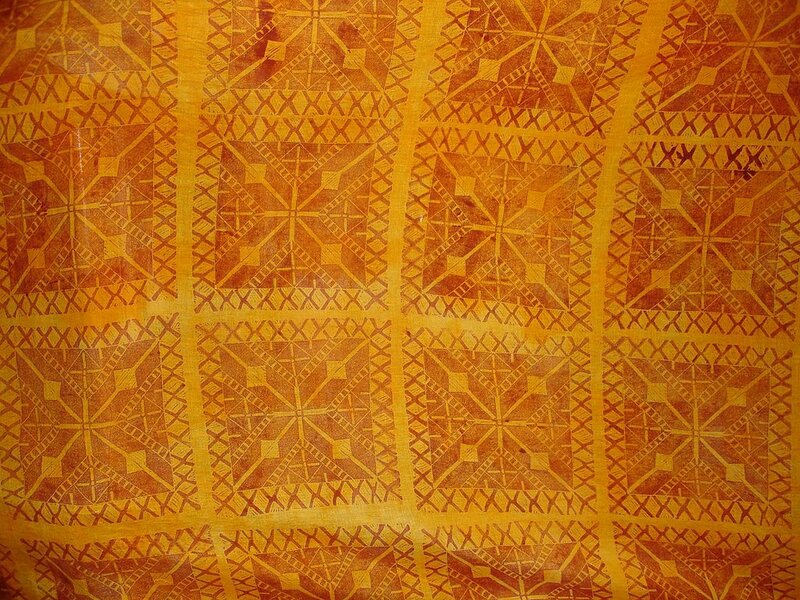 When the fabric you have printed is touch dry you will need to iron it in order to heat fix it (If using Trapsuutjies printing ink you heat set in the oven). When ironing I usually place a piece of muslin over the printed fabric and iron for approximately 3 minutes on the appropriate heat setting for the fabric you are using. Your fabric I snow heat set. I have been putting together a propsal for teaching in Palestine later this year at the request of the Sakakini Arts Centre. I am aware that there are only four sewing machines available to use and I suspect they will have limited capacity to free machine. I wish i could source some machines but then getting them into Ramallah will have its own difficulties if things continue as they are. However one of the things I have been looking at is stitching and cross stitching in particular- as the cross stitch embroidery of the region has cultural significance. That lead me onto thinking about the stitch. I have long been drawn to textiles by the stitch ( i used to do a lot of knitting making up things as i went ) much more so than the structural possibilities of weaving. I think I am drawn to the stitch for its mark making as well as its texture making possibilities . I particularly like the running stitch though am very drawn by cross stitch possibilities- especially when it has been done free form as it appears to be on the Syrian dress I purchased( which was on the blog awhile ago)- the slight irrgularity lending to its charm. I want to experiment more with ideas about the stitch . I am finding lutradur a good medium with which to experiment- it is strong enough to carry heavy weight thread without stretching the actual fabric. So here is some of the stitching I did today. 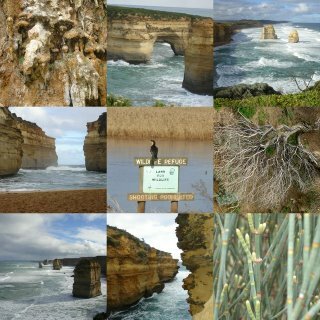 Home- as a an actuality and concept- we all 'long' for a home- not necessarily the bricks and mortar- we all seek what it means to us- family, surroundings, niches, neighbourhood, but for me apart from family, home for me is the nature that surrounds me. In an age when all art seems to be conceptual and in the realm of the digital and imaginary and in negation of the great natural beauty that abounds in the world- this is what i come home to- it is winter dormancy at the moment. In the Australian bush things do not leave their leaves and show their bones and the colours are amazing- the shapes enticing and well simply stunning. I am home and have to look all over again- I saw such a lot- I think my life has changed just a little again, and yet this nature brings me home every time.